With 30.6 seconds remaining in today’s NCAA Tournament East Regional Final at Madison Square Garden, standout UConn guard Shabazz Napier was fouled while attempting a three-point shot with his Huskies up two on Michigan State. But something strange happened as he stepped to the line for three critical free throws: The arena fell silent. That sort of thing is expected at an on-campus home game, but not at an allegedly neutral site, and certainly not with a trip to the Final Four about to be decided. Sometimes you can tell how thoroughly fans of a school have taken over a building by how much noise they make. But sometimes the silences say even more: Thousands of Huskies fans, arms raised over their heads in anticipation of a made free throw, kept quiet so Napier could take his shots in peace. He sunk all three, and moments later, Napier, his teammates, and all those UConn fans could celebrate together: The Huskies had moved on to the Final Four with a 60-54 victory. Madison Square Garden fancies itself as the Mecca of college basketball, but it doesn’t always live up to its own hype. For every memorable Big East Tournament final, there’s an early-round DePaul game with a noon start that lacks any sort of buzz. For every early-season neutral-site game between national powers, there’s a December contest between St. John’s and Fordham where it’s quiet enough to hear the Rams’ shots clank off the rim. But the atmosphere on Sunday was Garden college hoops at its best. 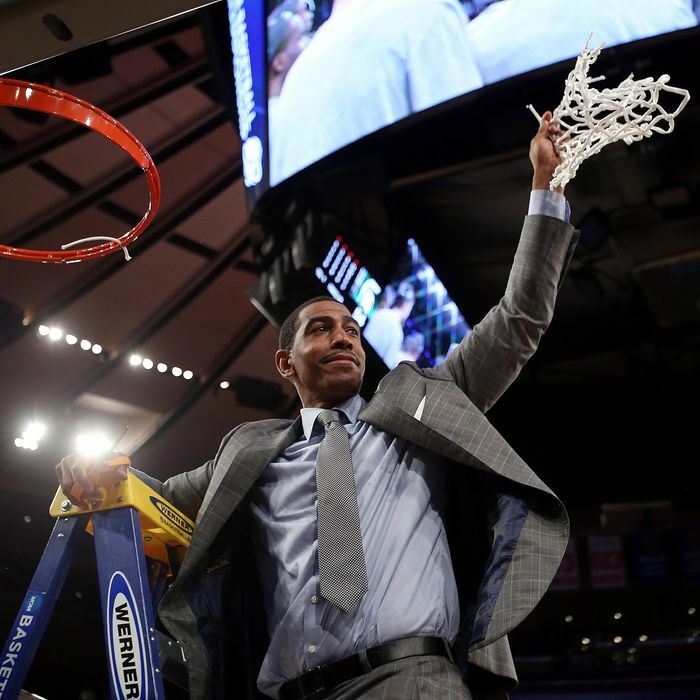 That buzz was thanks in large part to the presence of UConn, the former Big East member whose Storrs campus is less than 150 miles from Midtown. UConn fans, like Syracuse fans, have a history of taking over the Garden for big games, and so this was a neutral-site contest in name only: When the Huskies jumped out to an early 12-2 lead, the crowd of 19,499 exploded on every made shot. In the second half, when a Niels Giffey fast-break dunk gave UConn a 46-39 lead just seconds after a big Napier three, the one-sided crowd roared like it would at a Knicks playoff game. (Or to use a different measure of crowd preference: Former Husky Richard Hamilton got a huge ovation from UConn fans when he was shown on the Garden scoreboard; the cheers of MSU fans for former Spartan Mateen Cleaves, meanwhile, were drowned out by UConn-fan boos.) The pockets of Michigan State fans made some noise when the Spartans went on a run at the end of the first half and the beginning of the second, but otherwise they were overmatched. All those UConn fans drove ticket prices through the roof: Via Forbes, the average ticket on the secondary market for the East Regional Final had risen to $569 as of yesterday. The current Madison Square Garden had never hosted a NCAA Tournament game before this weekend. The NCAA regularly brought its postseason tournament to the previous Garden on 50th and Eighth, but as New York gained a reputation for sports gambling and the NCAA grew concerned about game-fixing scandals, it stopped playing late-round games at the Garden, and after 1961, it stopped bringing the Tournament there altogether. (Complicating things further was the Garden’s relationship with the NIT, which is now an NCAA-owned consolation tournament but decades ago was a legitimate rival to the NCAAs.) It wasn’t until 2012 that the NCAA announced it would finally bring the NCAA Tournament to the current Garden two years later.